Fashion Style: More Creative Uses for Cardboard - from Google! 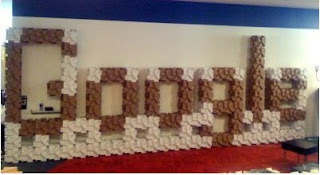 More Creative Uses for Cardboard - from Google! Remember when Jeni's Ice Cream made (or bought) those cute picture frames from cardboard? Well now Google engineers have been playing with cardboard, specifically Bloxes, which are like giant lego boxes, while they talk shop - you know, brainstorm bug fixes and new features. Tre fun, I say.